A lot of garage door manufacturers have begun taking steps towards making their products as environmentally friendly as possible. It pays to know your options, as a "green" garage door (and we don't mean green in color), can offer you a few worthwhile benefits, not the least of which being saving money. Insulated doors that are energy-efficient can really have a positive effect on your utility bill. Even if your door is made of steel, which is known to be a poor insulator, it can be equipped with additional materials such as polystyrene, polyurethane and many others, in the form of sheets or spray foam, which will allow it to become insulated in spite of its natural attributes. A common steel overhead door uses thick gauge steel as an outer layer, and the insulation core will be attached to this layer and added with a lighter gauge steel backing. R-value is the measure of insulation or thermal efficiency that a certain door has to offer. The higher the value, the greater the insulation quality. You can consult with our experts about your door’s R-value to be sure you are getting a model with as much insulation as you need. If you have an attached garage, then an insulated door will help you maintain a desired indoor air temperature, which will make things easier on your HVAC unit and therefore lower your energy spending. Of course, your garage door doesn't necessarily need to be added with extra sheets or foam in order to become insulating. The way it's produced and the material used to make it also make a difference, with wood being a great natural insulator. The brand you use also matter a great deal. Clopay, Amarr, Windsor, and many other manufacturers now follow environmentally friendly guidelines in order to ensure that. They use recycled cardboard, scrap metal, wood fibers, polystyrene and other materials in order to reuse materials and lower their overall carbon footprint. 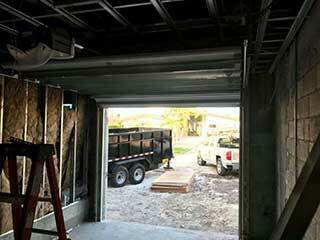 Many modern garage door openers are also designed to be as energy efficient as possible. If your unit is old, it may be time to switch over to new and improved model that also offers a higher level of safety and security. LiftMaster, for example, has newer units that feature switch mode power supply, much like your PC. The principle behind this is simple. During standby mode, consumed electrical power goes down to 1 watt, instead of the usual 5. If you'd like to learn more about how to make your overhead door as "green" as it can be, give our experts at Garage Door Repair Oceanside a call.